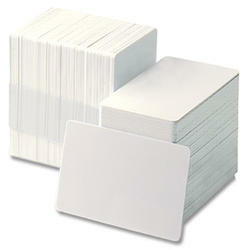 Genuine Fargo UltraCard PVC Cards, 10 mil (0.010") thickness, CR-79, Adhesive Paper Back, 500 count. Ideal for use with HID ProxCard II cards. CR79 cards are slightly smaller than CR80 cards. They are made to fit into the inner edge of a clamshell proximity card. Will work with the Fargo DTC1000 and any dye-sublimation printer capable of handling 10 mil (0.010") thick PVC cards.